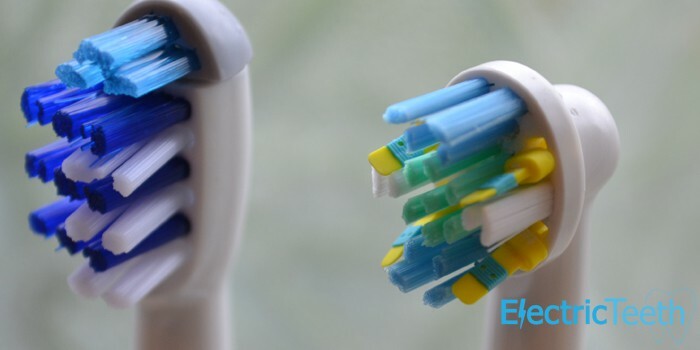 Oral B Pro vs TriZone: what’s the difference? Typically Oral-B Pro brushes come with CrossAction brush heads, whereas TriZone brushes come with TriZone brush heads. However, there are several other brush head types that can be put on either brush – all of them are listed in our graphic below. Left: TriZone brush head. Right: Pro brush head. Later on in this article we run through the technical differences between the way in which the TriZone and pro brush heads work (and there’s also a video explaining it), but regardless of which brush you buy, bear in mind that you can easily change the brush heads later, i.e if you buy the TriZone 2000 you are not stuck with TriZone brush heads forever, you can change to Pro brush heads. 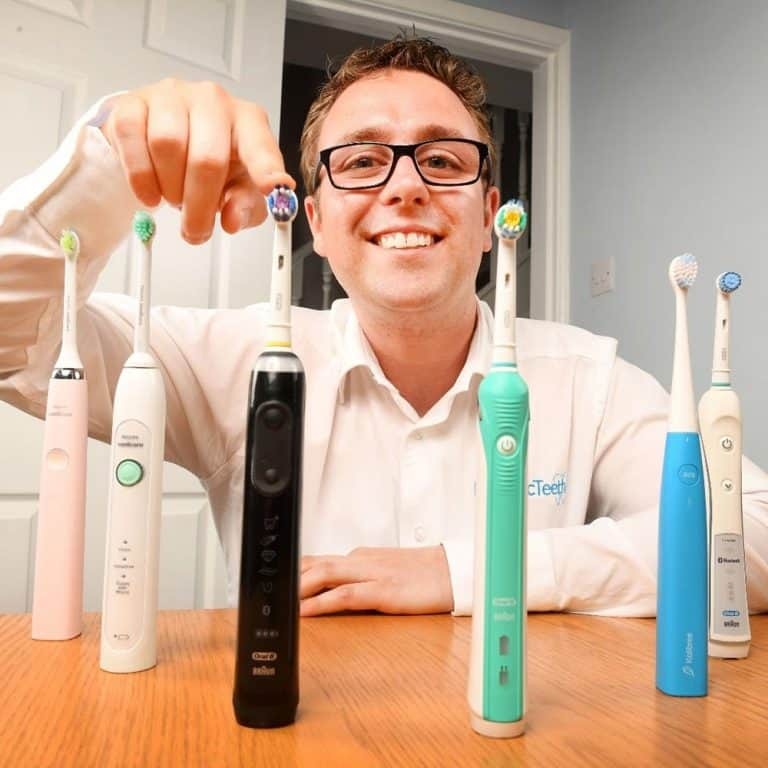 The situation is further confused by the range of Pro brush heads that Oral-B offers – we explain them in more detail in our Oral-B brush heads post. Regardless of the brush model you own, you can put any of these on an Oral B Pro or TriZone electric toothbrush. 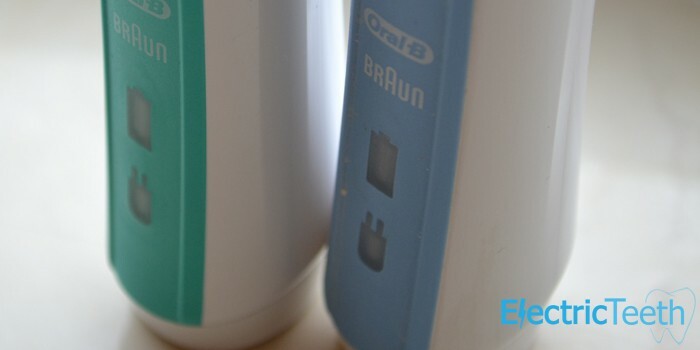 Oral B TriZone vs Professional Care: is the difference only the brush head? Oral-B appear to make it quite complicated to actually understand the difference between their Pro and TriZone series of toothbrushes. You can easily believe one does something remarkably different to the other, in a way they do, but not in the way you might imagine. An Oral-B Pro 2000 brush or an Oral-B TriZone 2000 brush has the same handle containing the battery, power button and important electric motor, but it is the design and action of the head that goes on top of this brush handle that differs. These different brush heads, be they Pro or TriZone are available for purchase separately, so you can put a Pro brush head on what was or is a TirZone brush and transform it into a Pro model. To add to the confusion what often happens is the colour of the brush changes too, but the technology in the actual handle does not. There is a difference though, which involves the way the brush head acts when the power from the handle is transferred to it. A TriZone brush has an action similar to that of a manual brush whereas the Pro uses an oscillate-rotate motion. You can see the difference in the way the brush heads look in in the image below. More like a manual toothbrush, the TriZone head is generally a bit bigger and the surface area is more rectangularly shaped than the oscillating rotating head. TriZone brushes ‘sweep’ against the teeth and gums to clean them. This type of brush head is actually split into 2 categories, standard oscillating and rotating brush heads with a 2D motion and the more advanced 3D brushing. Most oscillating rotating brush heads tend to be smaller and circular in size compared to the more rectangular shape of a manual or TriZone brush head. 2D brushing or a conventional oscillating-rotating heads have a rotary brushing action, where the bristles alternate back and forth against the teeth. 3D brushing is an advancement in design by Oral-B where a high frequency pulsing action is added to the 2D brushing movement. The high-frequency (sonic) pulsing action agitates the liquids that surround the teeth and creates what is known as a non-contact brushing effect where the plaque and bacteria on teeth is disrupted beyond a distance where the brush actually touches the teeth. Which one should I choose? TriZone or Pro? If you are unsure as to which to choose do not panic, you can always change the brush head at a later stage. Personally we would advise opting for the Pro, which tends to be the more popular as the size and motion of the brush head generally allows for a superior clean. TriZone brushes still clean effectively, but the way they go about the clean differs.